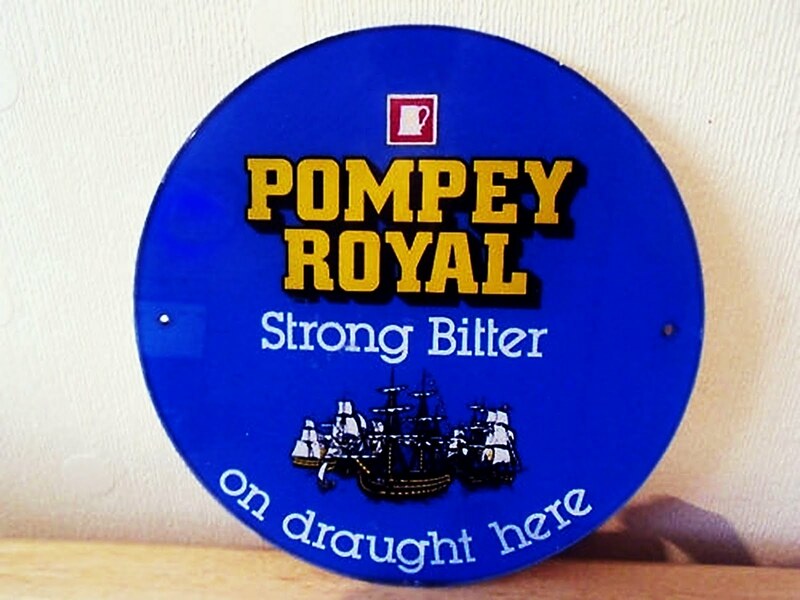 Pompey Royal Beer Mat, a photo by john lilburne on Flickr. Enough about old inns for now. Time for a beer. I'm very interested in the history of this particular beer.My first encounter with Whitbread Pompey Royal was in the autumn of 1985 at the Windsor Tavern (now the Earth and Stars), Windsor Street, Brighton. A few pints on top of a couple of weaker beers would give me a ‘thick head’ the next morning, so I learned to treat it with respect. I recall a potent, full-bodied, sweetish, malty brew, darker-brown in colour than most bitters. I didn’t record its strength but have assumed it to have been around OG 1046/7°. This may, of course, be a retrospective overestimate because, back then, there were fewer strong beers about and I wasn’t that accustomed to those that were. And yet - if I could place a glass of that Whitbread Pompey Royal side by side against today’s Oakleaf version, I’m sure that what I drank in 1985 would be darker in colour, fuller in body, sweeter and stronger – a different recipe in fact, even though my first taste of Oakleaf Pompey Royal led me to describe that as an “recognizable recreation”. But is there any hard evidence to back up my unreliable, subjective account? The 1990 GBG is significant in two ways. First, for telling us that Pompey Royal, still at OG 1043°, is being brewed outside Hampshire, at Fremlins, Court Street, Faversham, Kent, to be precise, an outpost of the Whitbread Empire. 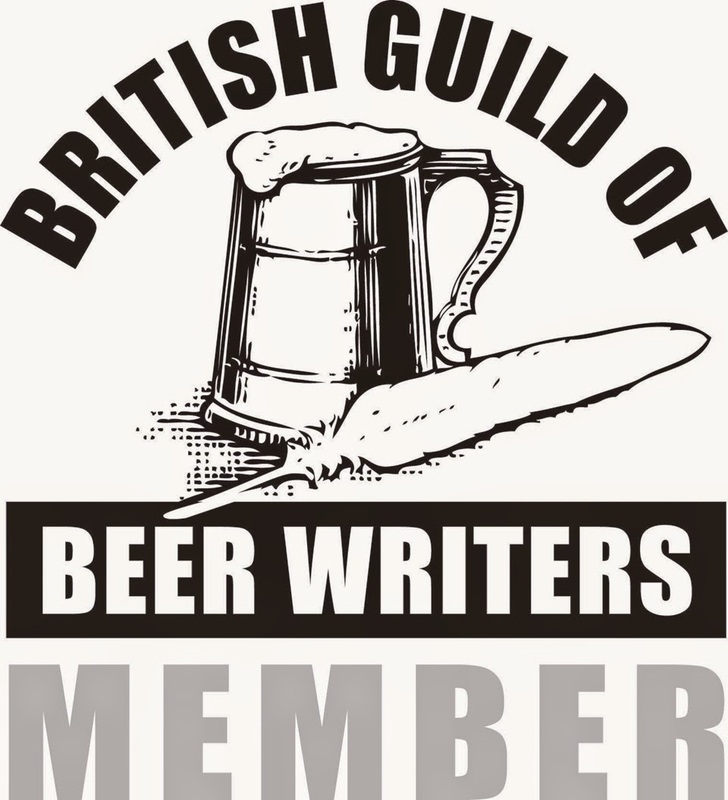 Second, this edition of the guide was the first to discuss the development of a “beer taste vocabulary”. So savour this tasting note from that year for the Fremlins version – “Deep russet-brown with a fruity aroma and a well-balanced flavour with fruit and malt prominent, a lingering vineous finish” – for pithy one-liners are the best we get from now on. The 1989 GBG, for examples, states only that the Fremlins version is a “Strong bitter with loyal Portsmouth following”. We have still some time to go before we find it brewed there because the 1984-1988 editions of the GBG place the production of Pompey Royal at Monson Aveune, Cheltenham, Gloucestershire, this then being “Whitbread’s only remaining traditional brewery serving the S. West, Wales and the W. Midlands.” So the beer called Pompey Royal that I first tasted at the Windsor Tavern, Brighton in the autumn of 1985 was actually brewed in Gloucestershire! And it had been so since 1984 when the Cheltenham operation went under the heading of Whitbread Flowers. So what kind of beer was it? 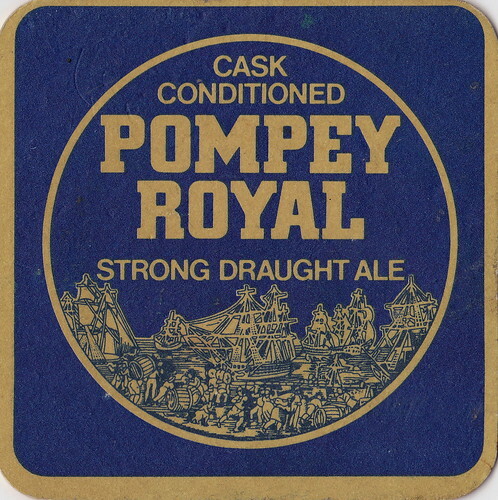 The 1986 edition records the Cheltenham version of Pompey Royal as simply a “stronger bitter”, while the previous year’s entry puts it as a “full-bodied bitter”. For both these years the beer remains at OG 1043° but the 1984 GBG gives OG 1046.9° for the first year of production at Cheltenham. Possibly this version used “the stronger, original Brickwoods Best recipe” recalled in the 1993 GBG. But how could it have been what I drank at Brighton, despite the OG coinciding exactly with my retrospective estimate? For given the compilation and production period for the GBG surely the 1986 edition would be the relevant one for the autumn of 1985. It is therefore hard to escape the conclusion that my memory is playing tricks on me. Evidence suggests that my first Pompey Royal was a less potent brew than I recall. The OG of 1046.9° is retained for Whitbread Pompey Royal in the GBG from 1983-1978, where it is described as “a full-bodied, well-hopped bitter”. The important difference is that it was then brewed at the Portsmouth Brewery, Admiralty Road, Portsea. This had been the home of Brickwoods until 1971 when they sold up to Whitbread for £15m. Two years later the businesses became known as Whitbread Wessex Ltd. While brewing continued at the Portsmouth Brewery until the autumn of 1983, production was then transferred to Cheltenham. Much of the Portsmouth site was demolished in 1989. The photo shows how flats and a car-park now cover most of the area. I had already found on p. 195 of Michael Dunn’s (1979) The Penguin Guide to Real Draught Beer, “Pompey Royal (1046) … the renamed Brickwood’s Best, an excellent full-flavoured bitter.” And there, listed under Whitbread in both the 1977 and 1976 GBG is Brickwoods Best (1046). No. 3 Mash Tun was normally used at Brickwoods for Pompey Royal, states the website ‘The History of Brickwoods of Portsmouth’. The recipe appears on a couple of home brewing web sites, which give their source as Dave Line’s (1978) book, Brewing Beers Like Those You Buy. In simple form the ex-Brickwoods Best version of Pompey Royal is Pale and Crystal malt, Fuggles, Brambling Cross and Goldings (or EKG) hops. Although a rather different beast to the Oakleaf version, it is almost certainly not the variety I first tasted in late-1985 at the Windsor Tavern, Brighton. A further point - while Brickwoods Best became Pompey Royal sometime around 1977, the latter name has an older provenance. That is why you follow me back to the 1950s in the Portsmouth and Brighton United Pompey Royal Blog.